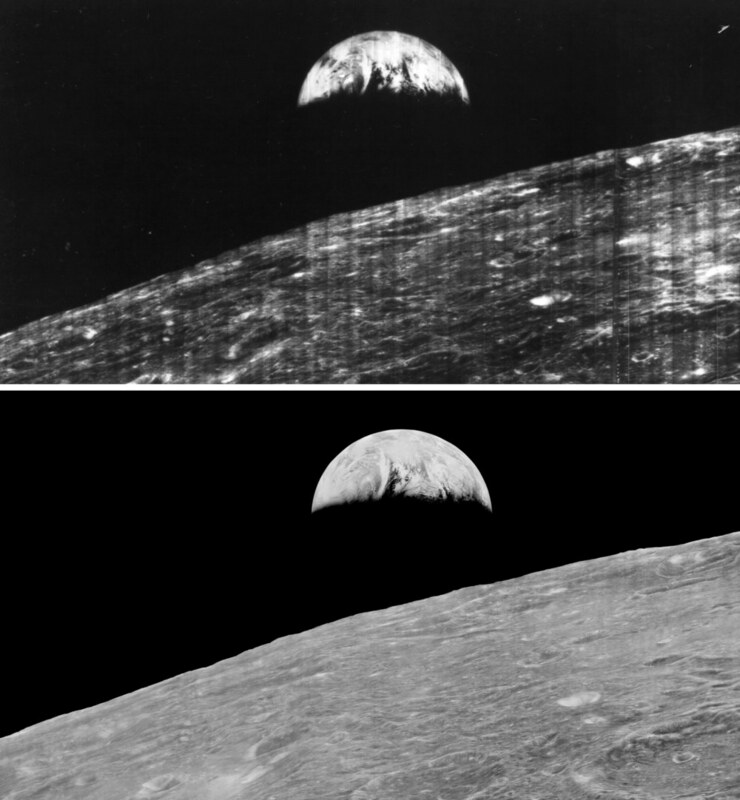 In 1967, the Lunar Orbiter missions sent back exciting -- but grainy and low-rez -- photos of the moon's surface. But it turns out that the Orbiters' photos were actually super-high-rez, shot on 70mm film and robotically developed inside the orbiters, with the negs raster-scanned at 200 lines/mm and transmitted to ground stations using an undisclosed lossless analog image-compression technology. These were stored on tapes read by fridge-sized $300,000 Ampex FR-900 drives. These images were printed out at 40' x 54' so the Apollo astronauts could stroll over them and look for a landing spot. But these images were not revealed to the public because NASA feared that doing so would also reveal the US's spy satellite capabilities. Instead, NASA deliberately downrezzed and fuzzed the images that the public got to see. Ryan Smith tells the amazing story of the preservationists who rescued the images off of disintegrating FR-900 magnetic tapes starting in 2007, under JPL's Nancy Evans, who set up her team in an abandoned McDonald's building and dubbed the project "McMoon." The McMoon team refurbished salvaged FR-900 drives, homebrewed a digitizer system, and painstaking recovered the 2GB/image files that the system generated. Evans's team has recovered 2,000 images from 1,500 tapes, all in the public domain and available for download on Moonviews.com. The Lunar Orbiters never returned to Earth with the imagery. Instead, the Orbiter developed the 70mm film (yes film) and then raster scanned the negatives with a 5 micron spot (200 lines/mm resolution) and beamed the data back to Earth using lossless analog compression, which was yet to actually be patented by anyone. Three ground stations on earth, one of which was in Madrid, another in Australia and the other in California recieved the signals and recorded them. The transmissions were recorded on to magnetic tape. The tapes needed Ampex FR-900 drives to read them, a refrigerator sizes device that costed $300,000 to buy new in the 1960’s. The tape drive that they found first had to be restored, beginning with a wash in the former restaurants sink. The machine needed a custom built demodulator to extract the image, an analog to digital converter, and a monitor connection to view what was happening. As the labelling system of the tapes had been forgotten, and documentation was not readily available, they had to hand decode the coordinates on the tapes. They also had a big collection from parts of other FR-900’s and similar designs. The spare parts were constantly needed to keep the recorder going, there was good reason that the format didn’t continue for for long.